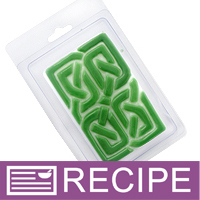 Pay homage to a Celtic nation with this Celtic soap! It is especially suitable in March for St. Patrick's Day or St. David's Day and in November for St. Andrew's Day. The Green Aloe & Clover Fragrance Oil adds a fresh green scent your customers will love! You Save $18.55 by purchasing this kit rather than buying the items separately. COMMENTS: I have liked pretty much everything I have ever ordered from Wholesale Supplies Plus except this. My husband decided to go off- list and purchase the Celtic soap kit that comes with these clam shells. My biggest problem was that you have to pour the soap mixture when it is hot so that it will in fact pour, unfortunately this melted the first clams shell distorting its shape and the finished product! I let the mixture cool slightly after this which made pouring very laborious. I also have to say that I personally don't have the patience- or perhaps the skill, to then fill each little Celtic design. Perhaps if this was on my list I would have appreciated it more. WSP Response: The soap should be poured between 125°-135°F which should be liquid enough to still pour. The actual pour temperature listed on the clamshell is 180°F. It is suggested in the recipe to outline the celtic rectangle so they stand out but, if you prefer, the soap can certainly be poured all at one time. • The finished product is very attractive. • The clam shells are not durable enough. • It is somewhat tedious to do.